In one storyline, a pale-skinned troll with bulging eyes befriends a beautiful young fairy with gossamer wings. Together they defend a forest near the UC Santa Cruz campus from a group of rampaging humans. Above: The first Santa Cruz Comics manga included “Against the Wall” by alumnus Doug Bragdon. Photo: Carolyn LagattutaAnother narrative follows the adventures of impoverished Mexican youth who dodge drones, robbers, and vigilantes, only to confront a border wall as they make their way across a desert toward the United States. These are two of the illustrated tales that fill the pages of a new glossy magazine called Santa Cruz Comics, which is produced at UC Santa Cruz and takes its cue from the action-packed, splashy style of manga comics from Japan. While many classic elements of contemporary manga are on display here—edgy visuals, racy references, and violent clashes between characters, for instance—this fledgling publication, founded and run by alumnus Douglas Bragdon (Kresge ’89, politics) has a uniquely activist bent. “I don’t think Japanese manga push an overtly political view,” said Bragdon, principal writer and editor of the magazine he launched in 2016 after spending about a year fleshing out the details. The major difference between Santa Cruz Comics and Japanese manga is one of sensibility, Bragdon said. Continuing in that activist tradition, Santa Cruz Comics includes features such as “Fairy and Troll,” which talks about the way humans are destroying the Earth; “Against the Wall,” which supports immigration rights; and “Moscow Hitman,” which is about the abuse of power in Russia. So far, the world is only just starting to find out about Santa Cruz Comics, which is available in a few select stores across the United States, including Santa Cruz’s own Comicopolis, a graphic novel and gaming store. But Bragdon has high hopes. He bluntly characterized this new publication as entertainment combined with “propaganda” in response to President Donald Trump’s election in 2016. 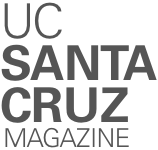 Bragdon staffs his magazine entirely with student interns drawn from a pool of applicants attending UC Santa Cruz. He spread the word by reaching out directly to students in various disciplines, including the arts and games and playable media. This is not the first time UC Santa Cruz students have helped bring comics to life on campus. Alumnus Jim Gunderson (Rachel Carson ’77, philosophy), a comic-books aficionado, collector, and donor, pointed out that the Graphic Stories Guild, a student-run comics club on campus in the 1970s, was based at College Five (now Porter College). “It was an entirely student-driven project,” Gunderson said. Like Santa Cruz Comics, their publications were also available off-campus. In fact, you can still find secondhand copies listed in an official underground comics guide. Gunderson, along with his friend Peter Coha (Kresge ‘78, mathematics), donated 1,700 vintage Marvel comics to UC Santa Cruz Special Collections and Archives three years ago. 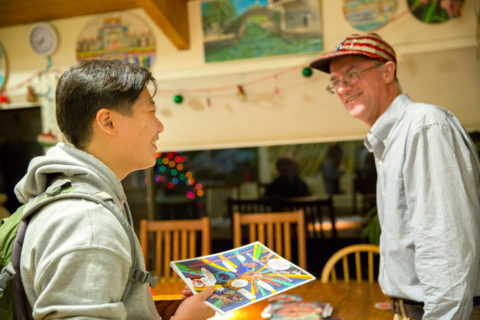 One recent rainy weeknight, a group of bedraggled students filed into the Stevenson Provost House to meet with Bragdon, who is married to Stevenson’s provost, Alice Yang, an associate professor of history at UC Santa Cruz. Most of the people who attended the meeting had already been selected as interns to work on the magazine, though a few other students were just tagging along, or were there to support their significant other. Santa Cruz Comics art by student artists. Clockwise from top left: Reshma Zachariah (Cowell ’19); Joyce Lin (Porter ’20); Romeo Jung (Porter ’20); Courtney Chavez (Porter ’18); and Chloe Calhoun (Crown ’21). The meeting was fast-paced. It was important to get the interns caught up. After all, production had already begun on the upcoming issue of the magazine before this latest crop of interns signed on; to make the process more efficient for himself and the students, Bragdon laid out the fundamentals of the stories and the storyboards before soliciting the help of these students. “Otherwise, I’d be like a movie director hiring actors without a script, and it would introduce a timing risk into the project,” Bragdon explained later on. Most of the selected interns were games and playable media and computer science majors seeking some extracurricular diversion, as well as a venue for their art and a way to make some money. But several showed up because of the magazine’s activist inclinations. “What drew me is the LGBT portion of it, and the fact that they are having those kinds of stories published,” said Charisse Lo (Crown ’21, games and playable media). As rain pelted the wooden house, Bragdon handed out basic black-and-white mockups detailing the action, dialogue, and narrative for each frame of the new manga-in-progress. The template drawings were deliberately threadbare; the young artists are given the freedom to fill in the details, while adding their visual spin and style. This method adds a splash of personality and a dash of intimacy to each issue. That creative freedom is good news for young contributors such as Tiffany Phan (Porter ’20, games and playable media), who is already an accomplished artist. During the informal meeting at the provost’s house, Phan showed off a detailed portfolio of her striking and painstakingly crafted images on her smart phone, including a horned imp-girl with an elfish face, and a haunting watercolor-on-canvas portrait of a despairing young woman floating in a pond, while holding a koi. “She wants to fade away from reality, but this fish means hope in my painting,” Phan said. After the artists finish drawing in the characters, Bragdon has them scanned and adds in digital text balloons. The magazine is full of surprises—there are several different storylines in each issue, hidden puzzles and backward messages, as well as flamboyant and mostly tongue-in-cheek Saturday Night Live–style parody advertisements. But the stylistic variations within each comic strip add another level of intrigue. Santa Cruz Comics, art by student artists: Charisse Lo (Crown ’21). For some students, this will be their first monetized artwork, but this manga also gives them résumé fodder as well as spending money. Students can even pitch Bragdon on their own edgy political comics. Nick Yi (Merrill ’21, games and playable media) is contemplating a comic about being Asian American, while touching on other issues, including the way people navigate their identities. The roots of Santa Cruz Comics go back to Bragdon’s time in Japan. In the early 1990s, he taught English classes there and started studying Japanese immersively for four hours a day. Bragdon was able to get work in the semiconductor industry, in part because of his proficiency with the language. Meanwhile, he brushed up on his speaking skills by binging on manga, which was written in Japanese that was more informal and conversational than the kind he was learning from textbooks. In 2015, after resigning from a nonprofit he was running, he decided to take advantage of his “between jobs” status. Bragdon, who has written two self-published novels, wondered if he could marry his interests in art, writing, and start-ups by creating homegrown manga. That’s when he realized that UC Santa Cruz would be an ideal place for such a venture.